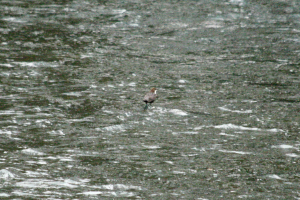 Observation - Dipper (Cinclus cinclus) - UK and Ireland. Description: observed sitting on a submerged branch and diving in for larva periodically. Another visitor to the river Rhymney. observed sitting on a submerged branch and diving in for larva periodically. Another visitor to the river Rhymney.